Setting healthy resolutions for the New Year seems like a good idea after all the indulgence of the festive season, but keeping up with them after January can be very challenging to see through, especially for those of us who have built up unhealthy habits over the years. Habits are actions that we often take without even giving it much thought, like snacking when watching the TV after dinner or putting extra sugar in our drinks. And when it comes to children, both good and bad habits are easily formed. Parents have the power to help their children create healthy habits from day one. The best way to do this is by setting them good examples and getting the whole family involved. Here are some healthy, realistic resolutions that will benefit the whole family. Even if it gets a bit messy, involving your children in making healthy meals will help to give them a sense of pride and achievements, whilst learning from a young age what constitutes a healthy plate. Kids are more likely to be willing to eat food that they may have been resistant to in the past if they have helped to make it themselves. Having meals together as a family gives you and your kids a chance to catch up. In fact, it’s often a good idea to take the focus away from the food during family meals and instead concentrate on having a good time bonding together. Research has shown that families who eat meals together tend to consume more fruit and vegetables, and less fried foods and sugary drinks. Adding just one fruit or vegetable to every meal or snack throughout the day is an easy habit to get into, and it can benefit your whole family in many ways. To make it even more fun, get your little ones involved in choosing which fruits and vegetables they want to add to their meals and snacks; try and have a variety of options each day so that you can all reap the benefits of each. This can be difficult for people who were brought up to always clean their plate but listening to your internal hunger cues and stopping when you feel full is a much healthier option. In addition, doing this will make it easier for you to work out how much food everybody needs to be full, to avoid wastage. Explain to your child that the most important thing when eating is to listen to their tummy, and they can always have more food later at a future meal or snack. Exercising together as a family can be tons of fun, and there are many ways to do this that make for great family bonding time too. For example, you might want to take the whole family out cycling, long walks with the dog, or taking part in sports together, such as football or tennis. Why not go to a local park and organize a ‘family fun day’ where you compete against each other for fun with sports or have races with prizes for the winner. You could even turn it into a great opportunity to meet up with other extended family members. Having consistent times for going to bed and waking up in the morning will help your child develop healthy sleeping habits for life. It can be tempting to treat your kids by pushing back bedtime for an extra half-hour or so, but this can backfire if your little one wakes up cranky because they’re not getting as much sleep as they are used to. And, if an early bedtime means that you are losing out on time together, you can always make up for this in the morning with a well-rested child. If you have teenagers, it’s important to stick to bedtime rules as they tend to need more sleep than most, thanks to their developing brains. Make sure to eliminate all distractions from their room and communicate with them often to help deal with any stress that could be contributing to sleeplessness. Comfortable, high-quality bed linen can also help teens to get more sleep. Now that you’ve tucked in your little ones, let’s talk about your sleeping habits. Being a parent can be tough and it will probably cost you a good night’s sleep more than once. Do your best to avoid that pattern whenever possible and fight for a proper rest – the whole family depends on it. Plus, you need to set a good example for your kids so they can see how important sleep is to be well functioning. Stress, in particular, is the culprit for many sleep problems in parents, which is understandable given the challenges they face. While some people experience relief using traditional medical options, new research is being focused on alternative options to effectively deal with anxiety. 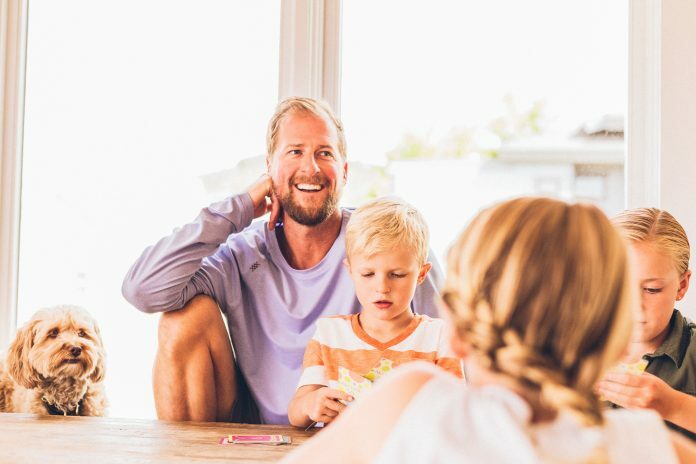 One of the most important things to understand is that forming healthy habits for your family can be a lot of fun. Don’t overthink creating healthy meals; turn it into a fun, happy time that you and your children can share together coming up with tasty and nutritious dishes. Talk to your kids about their favorite healthy habits and also encourage everybody to do these more often. As parents, you can help your children develop healthy habits for a lifetime. What healthy habits do your family have?